Austria is situated in central Europe, extending from the eastern Alps in its Western part to the Danube region in the Eastern part and, although land-locked, it is neighbouring to the Mediterranean area. The country has a wide variety of landscape, vegetation and climate zones, and as situated in the heart of the European continent, it has always been a centre for communication in trade and culture between different regions in Europe. Austria is a federal state of nine federal provinces covering a total area of 83,858 sqkm and with a population of 8.1 million. 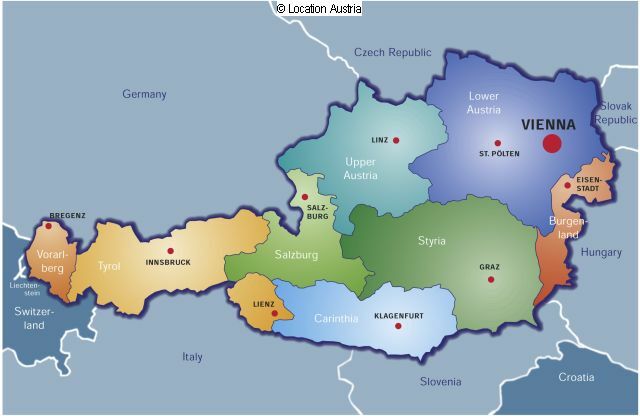 Austria has common state boundaries with eight other countries. The border line has an overall length of about 2,708 km. The federal Republic of Austria is a small state, whose origins can be traced far back into history. Populated since prehistoric times, it was Austria's location in the heart of Europe which caused involvement into nearly all historical developments of the continent . It evolved from a region on the fringe of the most important European cultures into a powerful empire and multiracial state, which collapsed at the end of World War I. In 1918, the small, newly proclaimed Republic of Austria followed by an administrative reorganization which among others resulted in an joint up approach for Topographic Mapping and Cadastre in close cooperation with Land Registry. Austria emerged from World War II and the sufferings associated with it as a neutral state in 1955, which has always played a decisive role in Europe. Since 1995 Austria has joined the European Union. The Austrian constitution is based on the Federal Constitution Act of 1920 as amended in 1929. The Austrian constitution is based on the undisputed principles of democracy, the republic as the form of government, federalism and the rule of law. The constitution also includes a number of instruments for performing direct democracy, such as citizens' initiatives, plebiscites and referenda. Fundamental rights and freedoms have always been of the utmost importance for the Austrian citizenship and continue to be given high priority in the Austrian constitution. Austria is represented by a President, who is elected every 6 years and appoints the members of the federal government. The parliament consists of two chambers, the Assembly of directly elected representatives at a 5 years term and the Chamber of representatives of the 9 federal provinces, appointed by the provincial governments. From the 13th century there were sovereigns who evaluated their income on lists ("Urbare"). In the Middle Ages it was common to document contracts on real estate within cities by chronologically updated lists. It was a documentation of individual civil rights and a precursor for a land register ("Grundbuch"). In 1718 the Austrian sovereign introduced a registration system for all buildings and parcels based on surveys and mapping in the fields within the Italian provinces of the Empire. "Censimento milanese" was designed and organized by Johann Jacob Marinoni (1676-1755). Within three years he managed the survey (including local triangulation) of 20,000 sqkm (which is as large as Lower Austria) only. 1812 the Civil Code was launched (Allgemein Bürgerliches Gesetzbuch): Principle of Inscription for immobile objects. 1817 Cadastre for taxation of achievable (not on de facto) profit from real estate based on objects = parcels. This was the first systematic registration of objects (parcels) of the entire state based on field survey. Completeness of taxed objects was guaranteed. 1870 Land Registry system was added to Cadastre introducing legal processes for documentation of owners and mortgages. The register was structured in 3 pages: (a) page A for objects, (b) page B for owners and ownership and (c) page C for obligations. The concept of this structure as well as the dual system of land register and cadastre is still in use nowadays known as Central European Land Registry system. 1969 Cadastre of boundaries (Legal Cadastre): The existing Cadastre (Land Taxation Cadastre) was extended by a qualitative attribute that secures the individual rights on boundaries. The requirements for receiving the qualitative attribute are a precise survey of the boundary lines of the entire parcel, negotiation with all neighbours on the spot and a written consent of all owners neighboring the specific parcel. Within the "Cadastre of boundaries" the state guarantees the geometry referenced to the Cadastre boundaries of a parcel. In the early 1980s the digital "real estate database" was implemented, which contains both the information from land book and from cadastre in digital format. The unified data base has completely replaced the analogue registers and allows a countrywide access by web based services. Since the beginning of the 1990ies, this unified database was made accessible through the web and was amended with the digitized cadastral map called "Digital Cadastral Map - DKM", which could also be downloaded by using modern interactive web tools. In 2004 the national Address Register was added to the Real Estate Database System and stakeholders such as municipalities, ministries e.a. were integrated as partner into the system of maintenance. In 2012 the real estate database has been re-organised and since then there are separate parts for the land register and for the cadastre, but updated simultaneously in a process, which is fully automatic. At the same time the subdivision documents produced by licensed surveyors, who take a legally defined role as partners in the Austrian cadastre system, are submitted to the cadastral offices for certification electronically. The institutional structure of the Land Management Sector in Austria has a number of key players with well defined functions and responsibilities: Subject - Right - Object: In Austria it is obligatory to register any real estate under the national system of land registration. Data about (a) Real property units, (b) real property rights and (c) holders of property rights are administrated and maintained by the cadastre authorities and by the land register authorities (local courts) with shared tasks and responsibilities. Each legal entity is mandatory identified by a property number ("Einlagezahl") and may be made up by one or more parcels. The same applies for real property units (objects). Consequently these unique identifiers for all these data categories are also used by other registers. 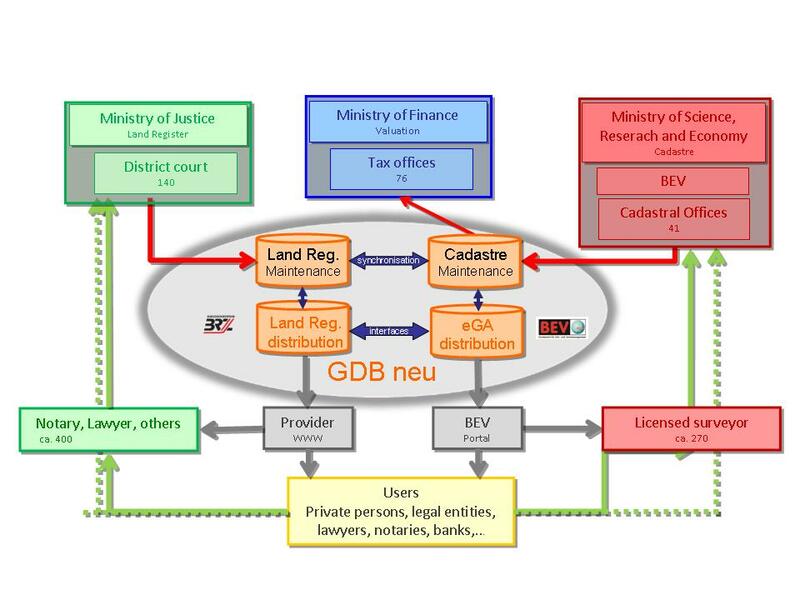 The legal task is provided by about 140 "Land Register Offices" ("Grundbuch") at local courts under the Federal Ministry of Justice . The technical task is provided by 41 "Cadastral Offices ("Vermessungsamt") coordinated by the "Federal Office for Metrology and Surveying" (BEV) which is affiliated to the Federal Ministry of Science, Research and Economics. Land Register Offices are operated within the local courts by a team of 3-5 public servants. A judge from this local court is supervising this team. Cadastral Offices are responsible for the registration and maintenance of objects (parcels, buildings, land use …) as well as the documentation of land use and soil quality. The Land Register Offices as well as the Cadastral Offices are part of the public administration. Notaries (private but publicly authorized) as well as attorneys at law assist citizens with services for transfer of ownership, inheritance arrangements, registration of mortgages, obligations and rights and others. Surveyors (private but licensed) produce the subdivision documents which are obligatory for subdivision of parcels and to restore boundary points. Licensing: Any surveyor who intends to work for cadastral issues has to apply for an authorisation as a Chartered Engineering Consultant for Surveying at the Federal Chamber of Architects and Consulting Engineers (Bundeskammer der Architekten und Ingenieurkonsulenten). The Chamber of Architects and Consulting Engineers as well as the professional subunits and the regional entities are public bodies and the statutory professional representation of state-authorized and certified technical consultants (architects and consulting engineers with a number of authorizations for technical, scientific, mining and agricultural disciplines e.a). There are about 300 Chartered Engineering Consultant for Surveying (Ingenieurkonsulenten für Vermessungswesen) registered in Austria, all of them as mandatory members of the chamber. It is the duty of the chamber to represent and promote the professional, social and economic interests of the technical consultants and to monitor fulfillment of the professional obligations of the technical consultants. University degree in architecture; technological, scientific and mining areas; areas connected with environmental and soil sciences. Professional practice of at least three years (after graduation). One of these three years has to be passed as an employee working under the instructions of the employer. Licensing Examination ("Ziviltechnikerprüfung") The Licensing Examination is a public oral exam and there are no remedies against the decision of the commission which is made up from experts from public and private sector. Every candidate has to demonstrate in the exam sufficient knowledge in the following areas: Austrian administrative law which includes especially the scope and basic knowledge of the different regulations; Business administration, especially basics in the fields of cost accounting, organization, personnel matters, investing and financing etc. ; Legal and professional regulations of the special professional field (e.g. architecture) · Professional laws and ethics of the profession. The authorization for professional practice ("Befugnis") is awarded by the Federal Ministry of Science, Research and Economics. For either architecture or one of the other branches of Chartered Engineering Consultants an own authorization is required. The licence may be exercised as well by the licensed persons themselves or by a business company with at least one person holding a licence. The process to become a Chartered Engineering Consultant is concluded by taking the oath to observe the law, to take responsibilities and the duty to keep confidential. Two Austrian institutes, the Vienna University of Technology – TU Wien (TUW) and the Graz University of Technology - TU Graz offer academic education in geodesy, geoinformation, land management and surveying in a full program. The curriculum is made up of six terms (semesters) for getting graduated as a Bachelor followed by a 4 semesters study to get graduated as Master of Science. Besides, the baccalaureate is concluded with the academic degree Bakk.techn. (Bakkalaureus/-a of technical science) and the master curriculum with the graduate as a Dipl.-Ing. (Diplomingenieur) which is equivalent to a MSc (Master of Science). The Austrian system is a "title registration". The owner as registered in the Land Register enjoys public confidence of being owner. The title registration into the Land Register is operated in close cooperation with the Cadastre. A development to cover the following aims can be recognized: to administrate critical items, to calculate tax for subjects, objects or rights and to control the processes, infrastructure and their changes. For all of these it was and still is necessary to collect data and control over the 3 basic categories of data: subject, objects and rights as relation between subjects with objects. The Austrian cadastre is used for multiple purposes and serves as the basic system for building permission procedures, zoning plans, land planning, addressing as well as for IACS (Integrated Agricultural Control System). Most of the Austrian administrative processes, either on federal or on provincial or municipality level, related to any kind of property or land, refer to the cadastral parcel as basic unit. This fact has made the Cadastre an unevitable part of the Austrian administration. Land register and cadastre are fully independent in organization, personal and financial matters but they are unified in a common data base. The digital "real estate database" ("Grundstücksdatenbank") contains both the information from land book and the cadastral register. Each land register office and cadastral office maintains the data (within its jurisdiction in the data base. The technical support of this central organized data base lies in the responsibility of the Federal Office of Surveying and Metrology. All information in the records is fully open to the public. There is an open access to the information by using modern web based services. All land book courts, cadastre offices, notaries, licensed surveyors, banks and many others have online access to the database. A plot of land (parcel) shall be the part of a cadastral community referred to as such with an individual number in the cadastre of boundary lines or the property tax cadastre. Cadastral communities shall be those parts of the surface of the earth explicitly registered as such in the cadastre of boundary lines or the property tax cadastre. Therefore a plot of land is a part of the surface of the earth with an individual number. Real Estate: land and any things attached to the land including buildings, apartments and other construction. The Cadastral Map (Katastralmappe) forms one part of the Cadastre. Its aim is to make the position and geometry including boundary marks of the parcels visible and to show the limitations between the different types of land use including buildings. It also contains information on numbers of boundary points, reference points and on some other attributes. The Cadastral Map has been developed since 1817 in paper form for the entire area of the Austrian Empire. Since 1987 the map has been digitised and been made available countrywidein a digital format (Digitale Katastralmappe - DKM) since 2004. The content of the Cadastral Map is consistent to the information in the database of the Cadastre (parcels , coordinates). Similar information is taken together in layers. The Cadastre Map gives a graphic presentation of the digital Cadastre. It is used as a basic information system for numerous applications such as urban and rural planning, facility management etc. Cadastral map information is available for the entire area of Austria starting with the paper maps from 1817 to the digital content to date. Historical (analogue) data is available in paper form or on micro fiche in the Federal Office of Metrology and Survey (BEV). The Digital Cadastre Map (DKM) is available also via web. 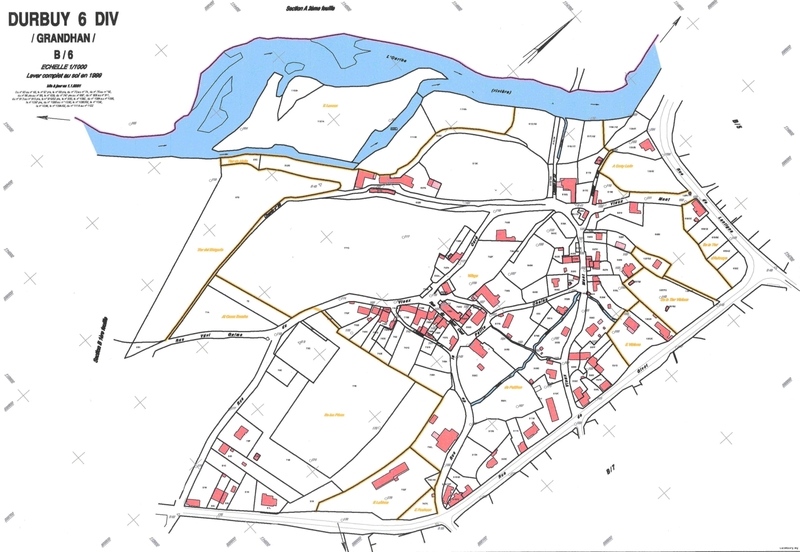 The contents of the Cadastre is divided into essential information levels, like for instance parcel boundaries, parcel identifiers, land use, buildings, control settings and boundary points. Austrian surveying legislation stipulates that the boundary cadastre must be managed by computer-aided methods on the basis of the real-estate database. The real-estate cadastre is used for the binding verification of real-estate boundaries and for visualizing types of land use, area dimensions and other specifications in order to facilitate the identification of plots of real estate. The area-wide data of the real-estate register is stored centrally together with the entries in the land register in the real-estate database. It is managed in distributed mode by means of remote data processing by the surveying offices and land-register tribunals in a manner assuring that the statutory responsibilities are honored. The cadastre and land register forms the nationwide soil information system which refers to soils and to real estate. Data about land are accessible to everybody in Austria. This fact is one of several reasons why data managed by Land Register and Cadastre are used for so many different customers. As a result of that multipurpose use of data not only cost recovery is guarantied but also the demand to use common and unified data for management, administration, documentation and individual security is satisfied. Examples for users and demand are given in the following part. The direct access via computer and public network or via Internet) is very popular. This method of access to data is used by notaries, credit institutes, licensed surveyors and other professions. Data on tape or any other digital medium are frequently requested by users which are interested in larger areas or for planning purposes. The typical individual client however is still going to the Offices to get the information needs printed on paper to get information about individual civil rights, subjects or objects. 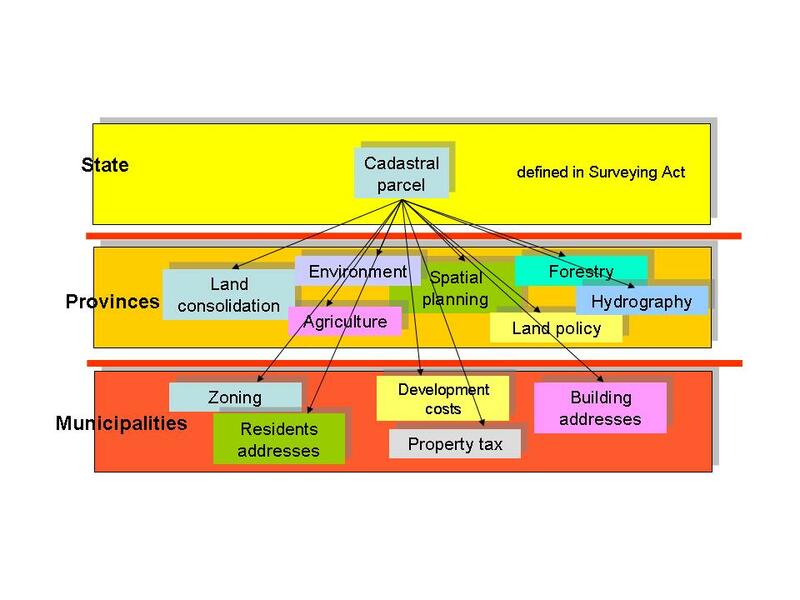 The general plan about urban and rural planning over a longer period is based on cadastral data. This demand of local authority allows a definition of proposed land use; The assignment or allocation of a specific parcel for is pointed out in the Zoning Map which has two different functions: Regulation function: Each assignment/allocation is related with different ownership-rights (e.g. the dedication "Greenland" implicates a building ban for the parcel). Development function: Each assignment/allocation shows the potential use of parcels that must not necessarily be identical with the actual use (e.g. a parcel dedicated as "Building Area" is used as agricultural land at the moment). For parcels in rural areas the Austrian Cadastre contains an index that depicts the soil quality (Ertragsmesszahl). Soil quality is valued by soil experts of regional Tax Offices which are provincial departments under the Ministry of Finance. The valuation is based on the nature of soil, on the topography (relief) and site of the area, and finally on the water and climatic conditions of the site. The results of valuation are visualized in analogue and digital maps, the so-called Soil Estimation Maps. The final soil quality index of a specific parcel that serves as the basis for the taxation of farmers and agricultural enterprises is derived by the intersection of this soil valuation data set with the digital cadastral map. Usually these data sets only can be accessed by financial authorities and surveying authorities. The Danger Area Plan outlines areas with a specific risk of natural disasters (e.g. avalanches, land slides, floods). Usually the different zones are linked with different land use restrictions. The composition of Danger Area Plans lies in the responsibility of the Regional Offices of Risk Protection which are subordinated to the Austrian Ministry of Agriculture, Forestry Environment and Water Management. Danger Area Maps are based on cadastral maps and are produced for municipalities with a given risk probability. Citizens are enabled to have a free look to these maps in the specific municipality or in the Regional Office of Risk Protection. Cadastral data are also used within facility management, even when cadastral data are not designed for that purpose. Control of Resources (forests, wine) is another example where governmental as well as private institutions use cadastral data for their decision-making. The Ministry of Agriculture and Forestry administrates subsidies within handicapped rural areas based on cadastral data combined with their data and rules. Currently address-matching is often used to combine cadastral data with statistical data from the Federal Office for Statistics or other sources. This is a common method to bring databases into relation with their geographic position. This process called "geocoding" needs geographic information which covers the whole country. For the moment the analogue archive of cadastral maps, subdivsion documents, protocolls, surveying documentation which is hosted by the cadastral offices all over Austria is going to be digitised and centrally stored in BEV. The intention is to make the historical content of the Cadastre available from web and thus independent from location of user. Modernization of technical aspects (data model, process model and metadata), IT-tools and marketing for brought use of these information as part of an information infrastructure provided by the government (eGovernment). Die Grundzüge des österreichischen Katasters, in Rechberger (Hrsg), Wiener Konferenz über ein modernes Grundbuch (1998) 25. Mansberger/Muggenhuber: Geo-Data Infrastructure for Land Management in Austria. Conference Proceedings of the FIG Working Week 2004 "The Olympic Spirit in Surveying", 22-27 May 2004. CD-ROM. International Federation of Surveyors, FIG, Denmark, 2004. Muggenhuber, Public Land Administration - Cost Issues and Alternatives, International Conference on the Development and Maintenance of Property Rights, Weltbank Konferenz, Wien, April 1998. Twaroch, Muggenhuber, Evolution of Land Registration and Cadastre, Joint European Conference and Exhibition on Geographical Information (JEC), Wien (1997). Twaroch, Organisation des Katasters - Ziele, Grundsätze und Praxis, GeoInfo Series Nr. 14, Technische Universität Wien (1998).